Among today's flood of decorating advice, domino magazine has attracted a fiercely loyal following that looks to the brand as a true standout. 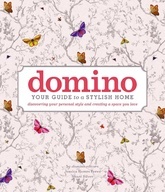 Now, the experts at domino take a deep dive into the details of home decorating with a guide to styling a space you truly love. First, you'll draw inspiration from hundreds of beautiful photos of real homes to identify what you want. Then, you'll put your plan into action as you style the major and minor components of your home, from textiles to table settings to art. Helped along with essential tips on key pieces, accessories, colors, patterns, objects, decorative treatments, lighting, and more, you'll learn how to create magazine-quality looks in your own space, your own way. Color photos.